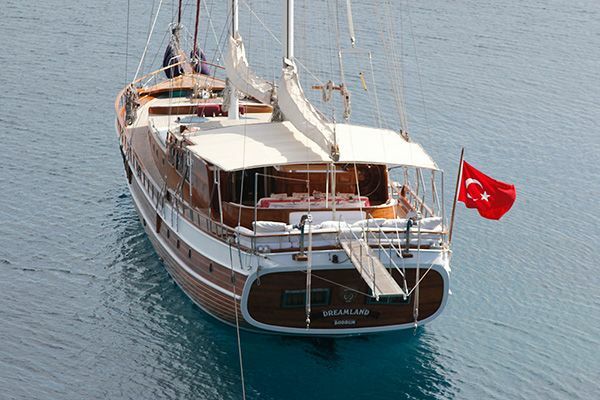 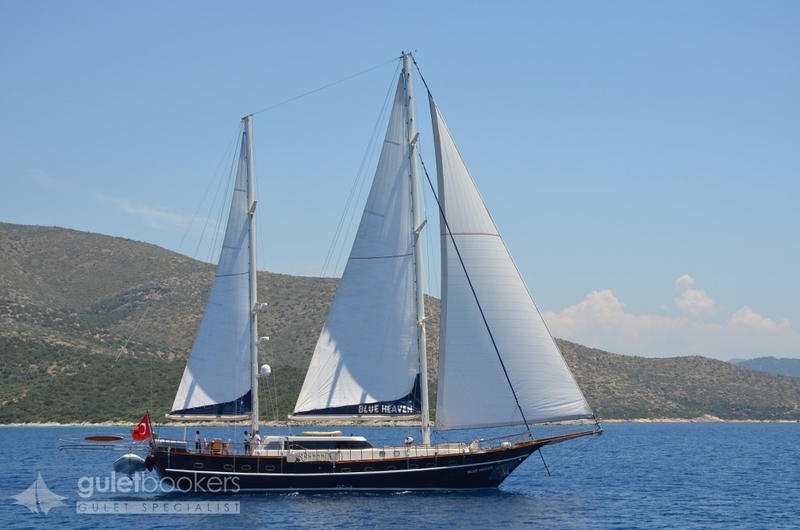 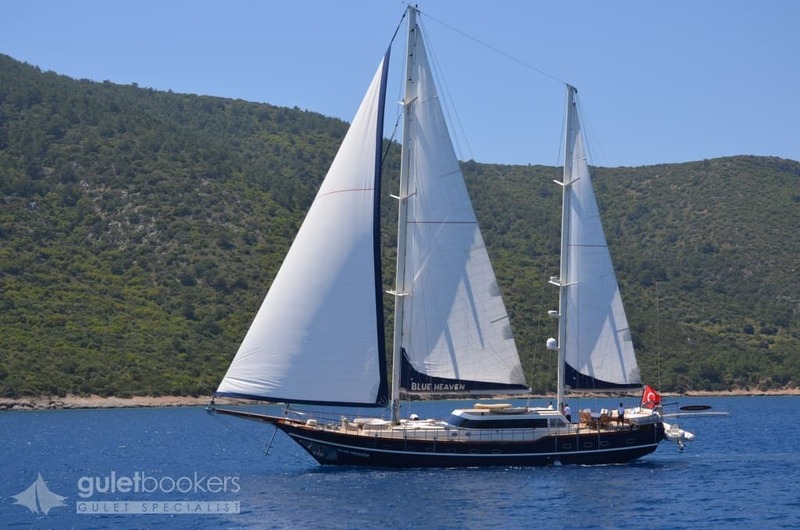 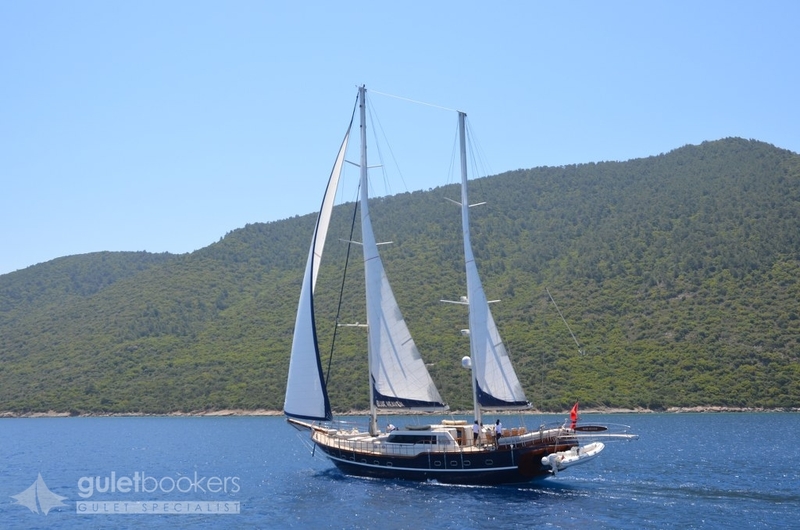 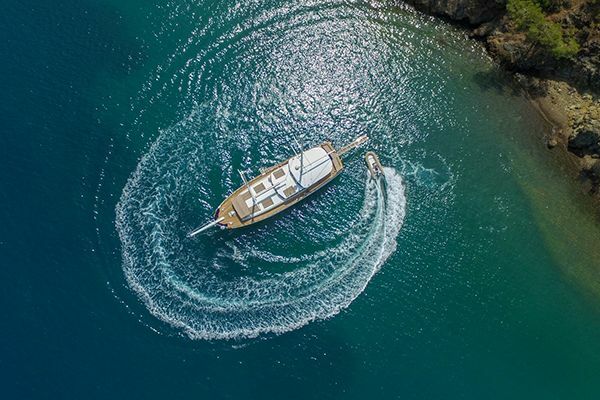 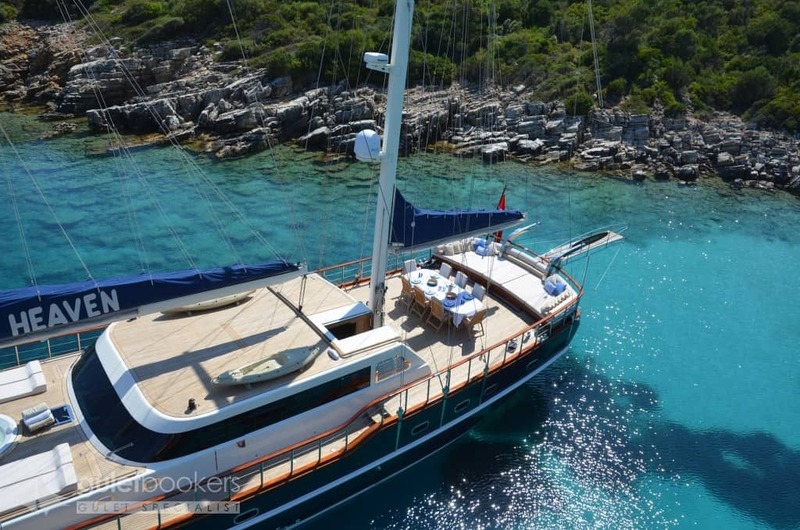 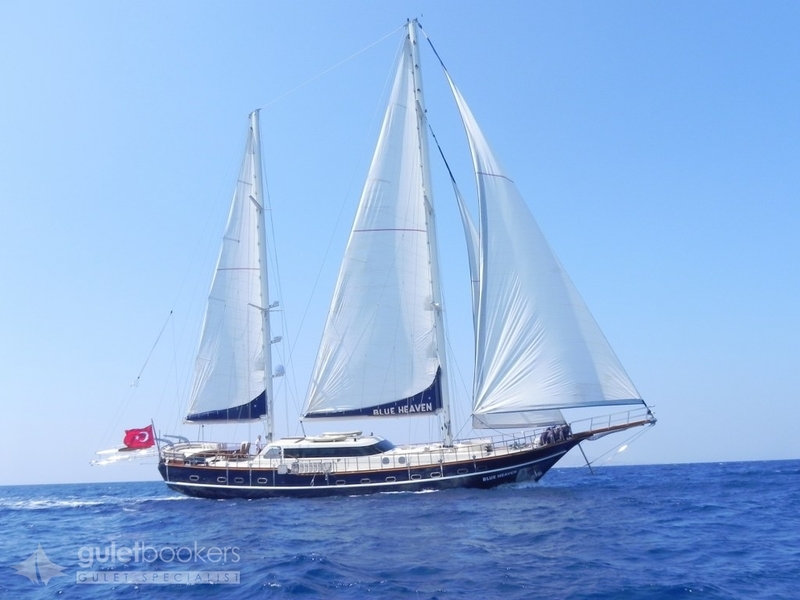 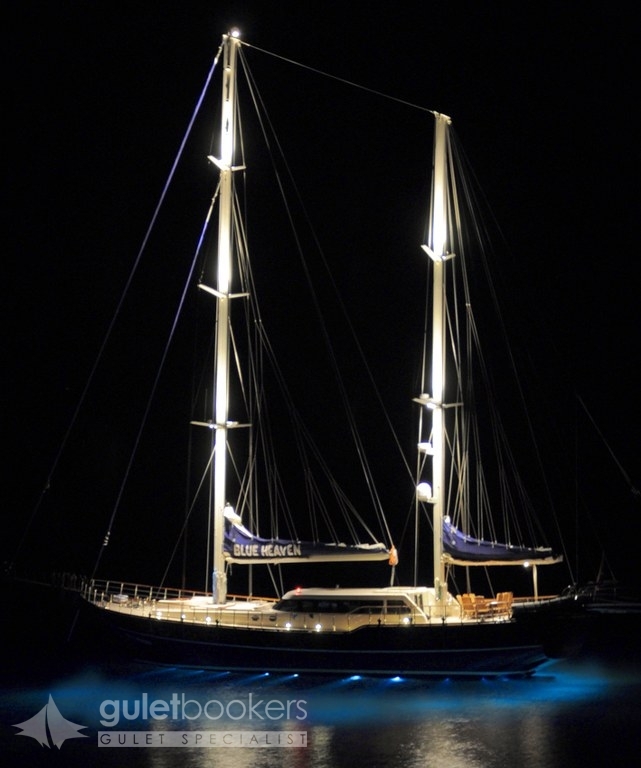 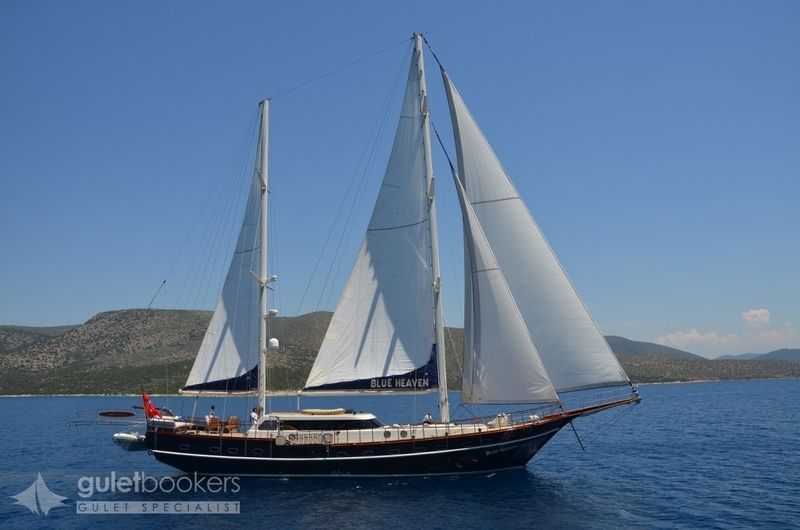 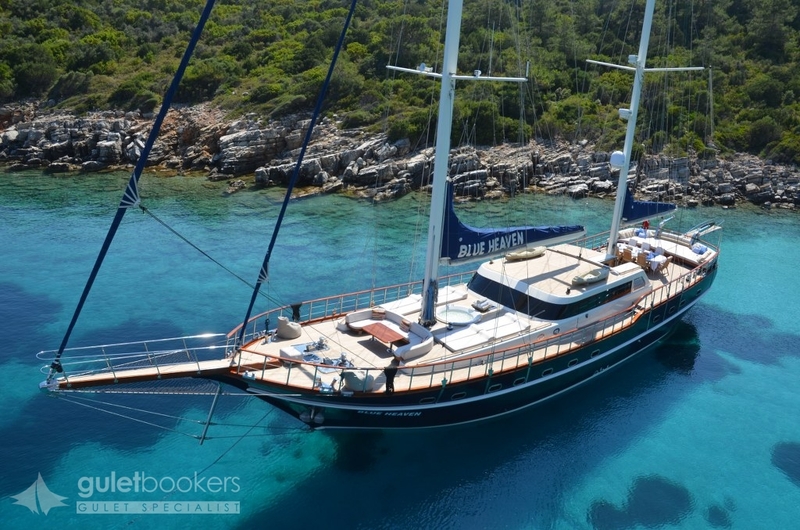 The exquisitely luxurious gulet Blue Heaven is a delightful 29 meter four cabin VIP class gulet which offers guests one of the best experiences on a gulet cruise possible. 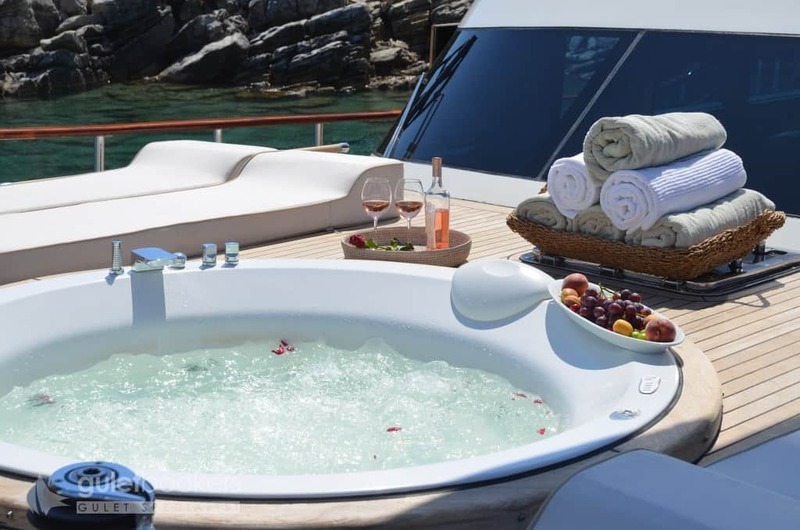 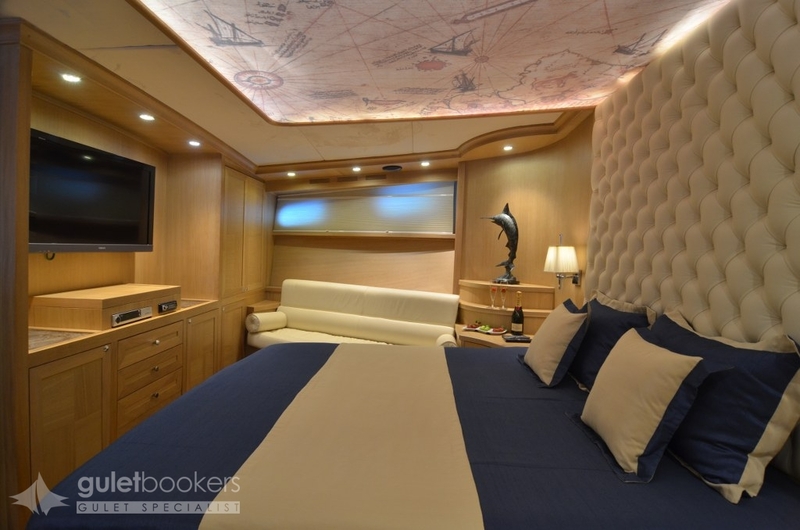 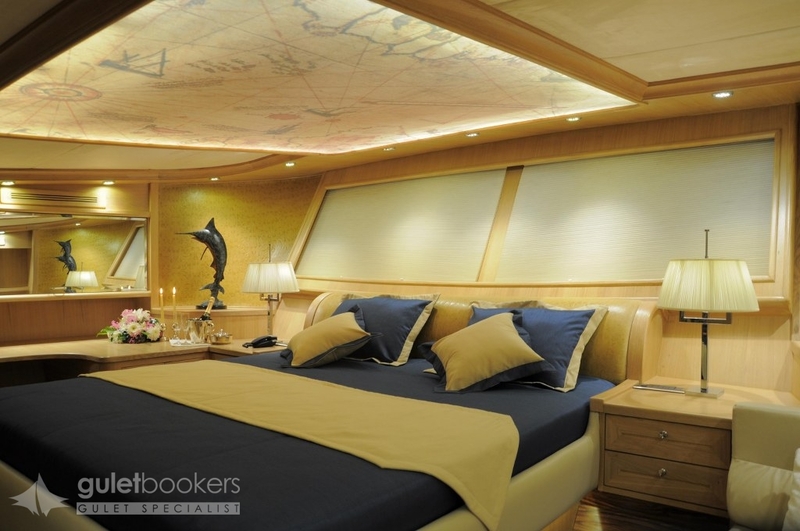 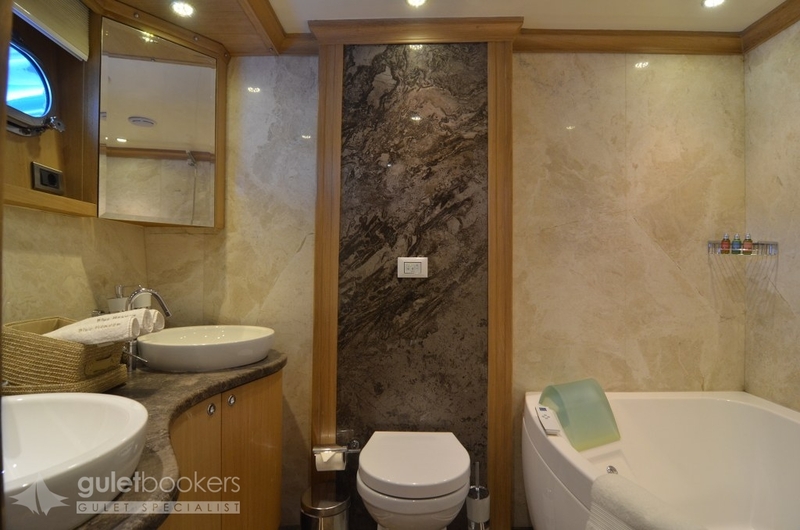 From her striking blue and mahogany hull to the master suites’ steam bath and Jacuzzi, every feature has been designed with great attention to detail and with exceptional good taste. 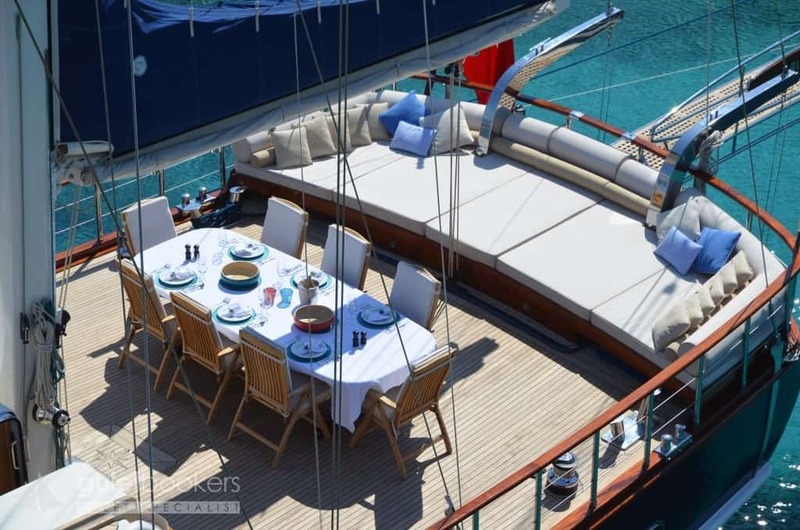 The choice of state-of-the-art, quality fittings for the gulet goes beyond the decorative to the functional, to every item on the yacht, ensuring every person on the boat is experiencing and working with a safe and efficient environment. 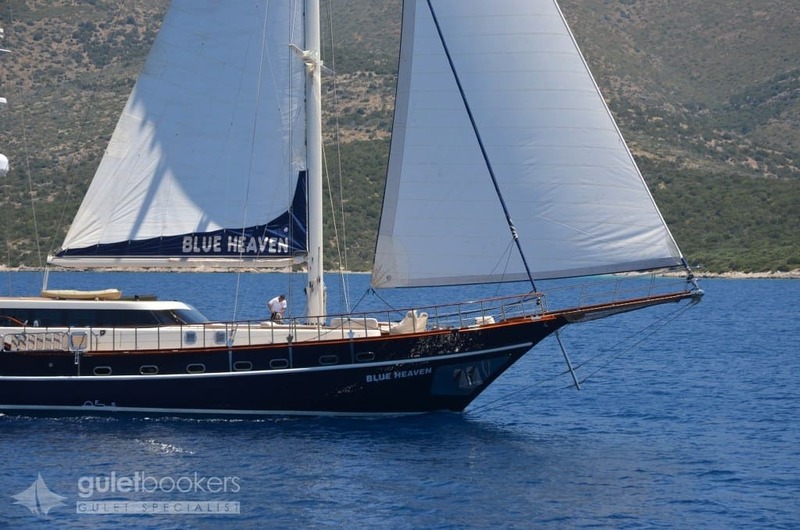 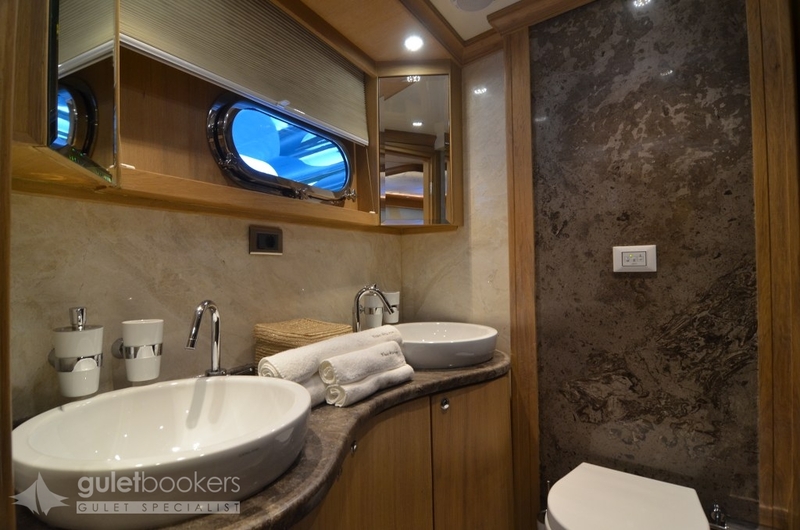 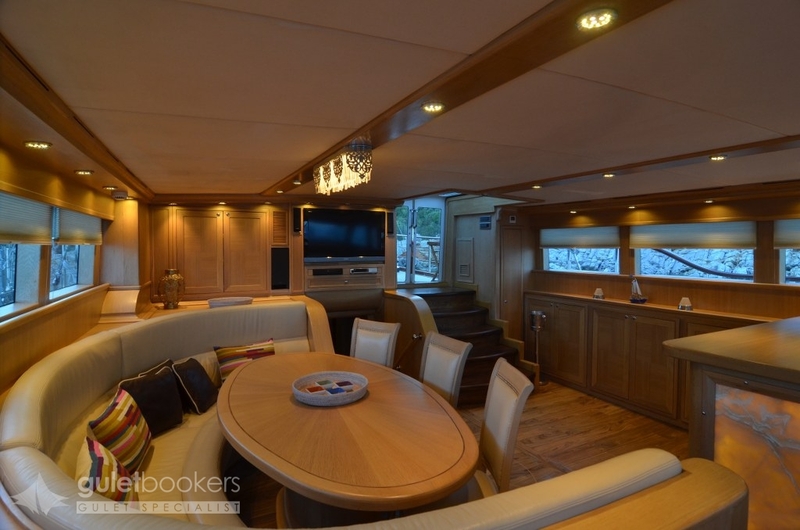 The master cabins on luxurious yacht Blue Heaven are luxury suites located at either end of the gulet, with a twin cabin placed beside each master cabin. 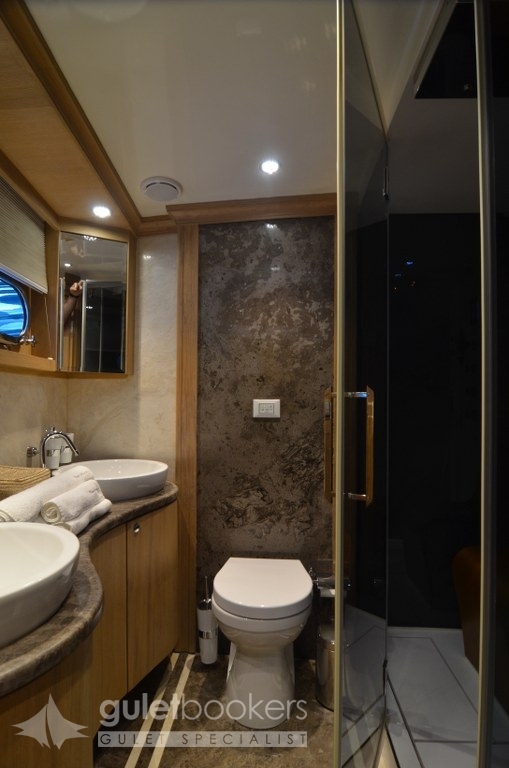 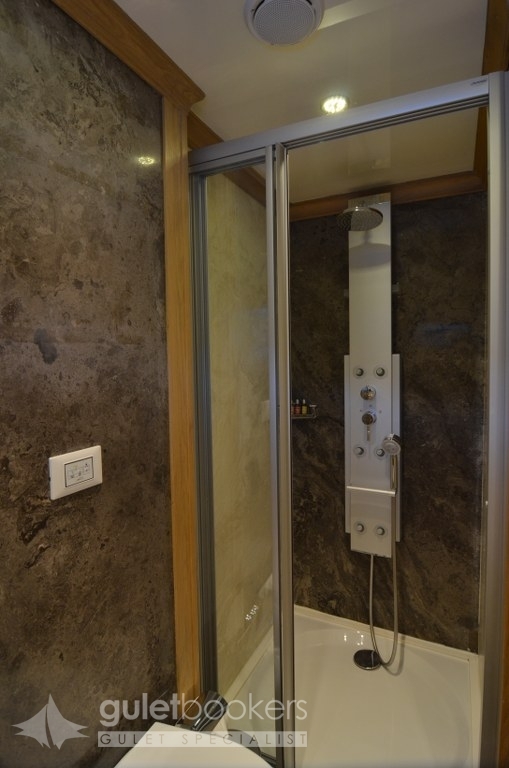 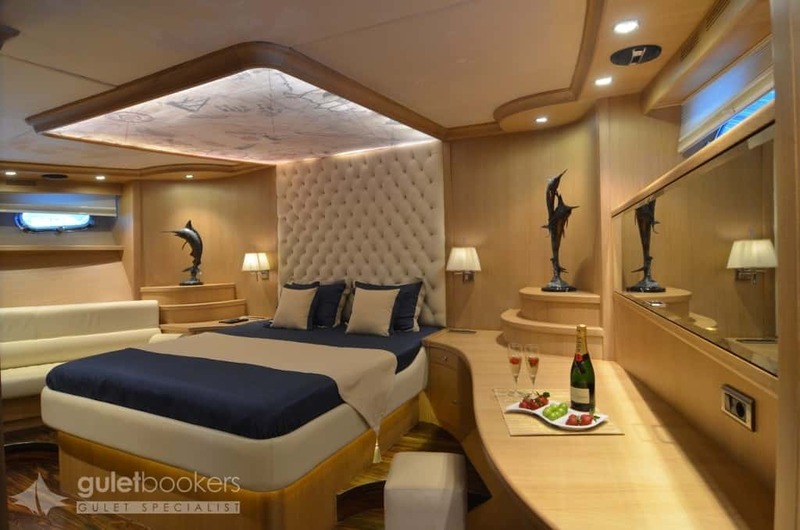 Each of the four cabins is fitted with a minibar, personal safe, and a sound system for both room and bathroom, and a television with satellite access. 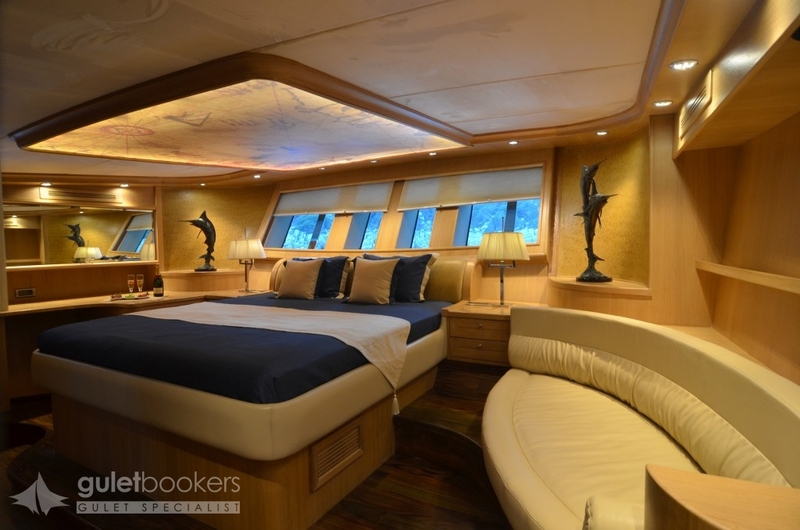 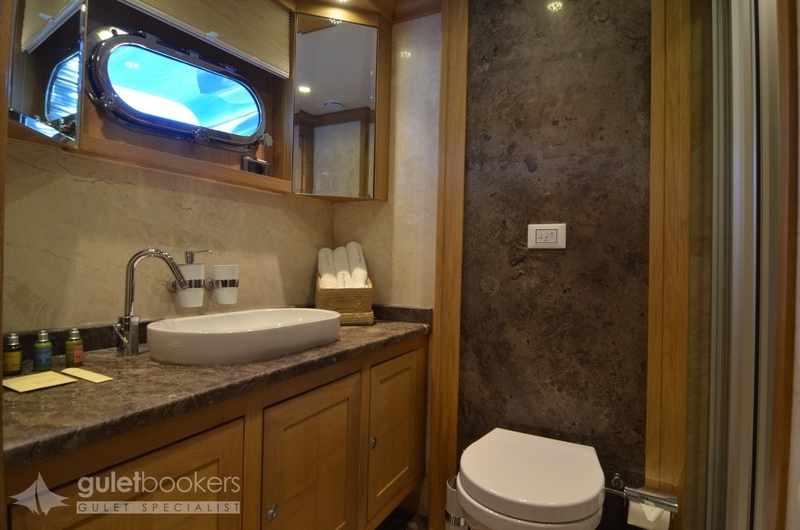 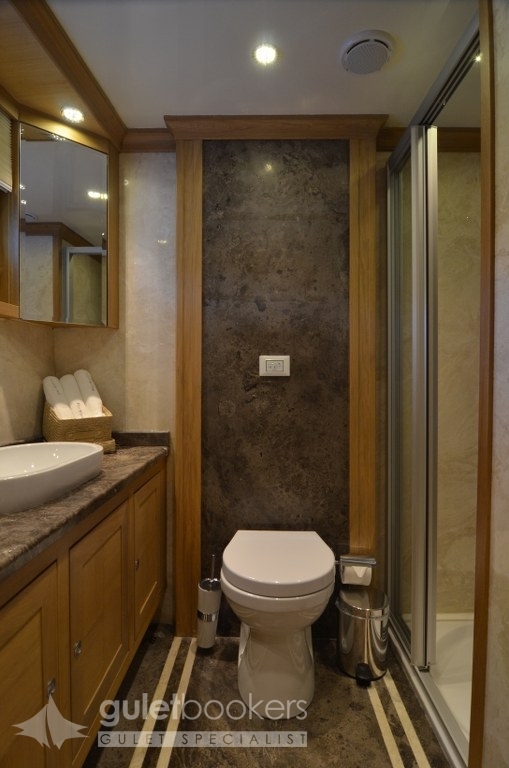 The forward master suite enjoys the abundance of space across the beam with a king size bed, side seats upholstered in Italian leather, vanity desk, storage, and the bathroom fitted with the private Jacuzzi and the shower and twin wash bowls. 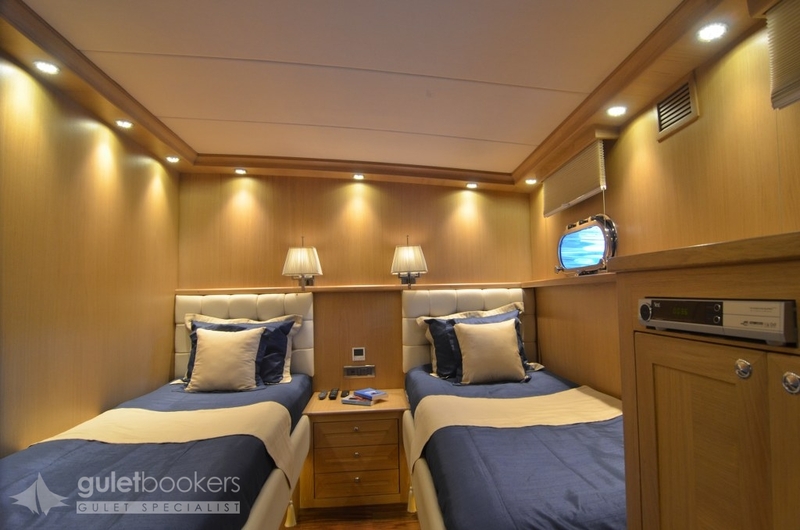 The aft master cabin likewise enjoys the space afforded by the cabin design across the stern of the gulet together with the rear window light, the king size bed, side seats upholstered in Italian leather, and a bathroom fitted with twin wash bowls and a full steam bath and shower unit completed with a teak seat. 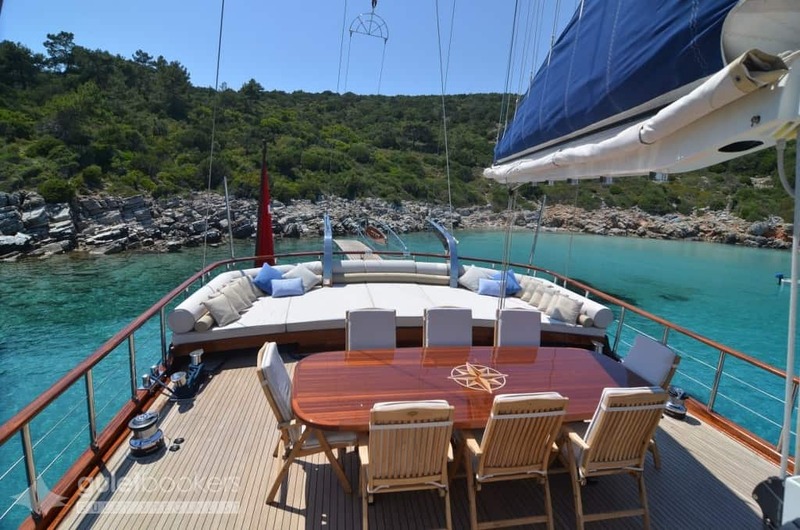 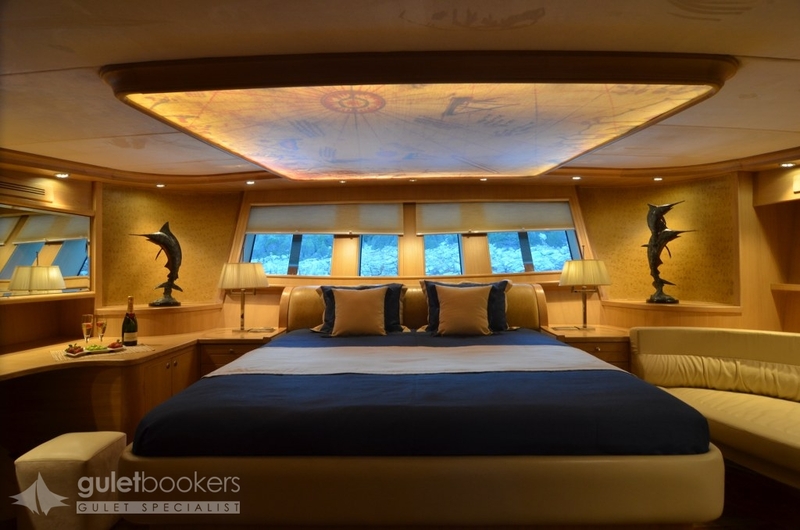 Both masters and the twin cabins have the signature textile and fabric furnishings chosen for the gulet, displayed throughout. 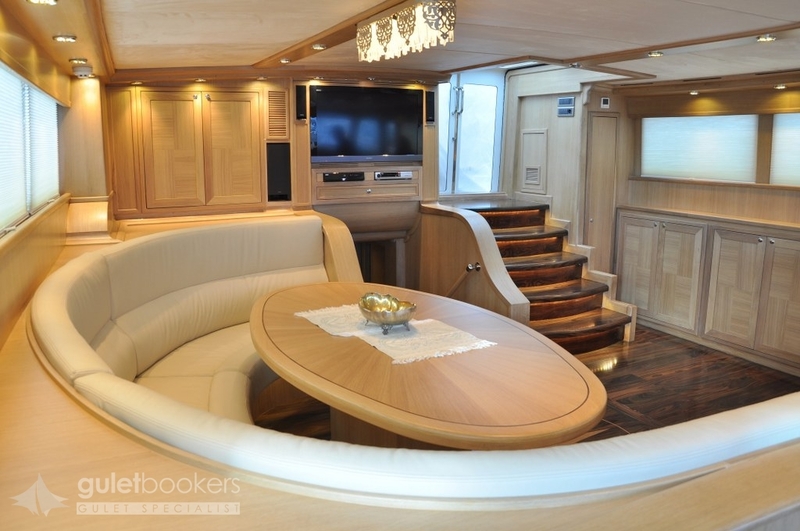 The saloon is a delightful retreat and gathering point for guests who either may want to surf the full scope of the connections available: Wi-Fi, full music system, and television with home entertainment system, or enjoy a full formal dinner at the dining table in air-conditioned comfort. 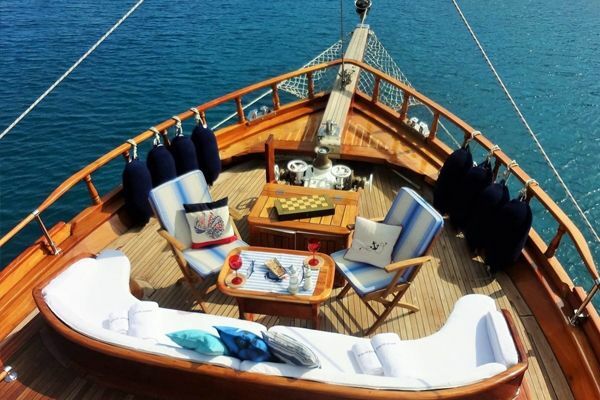 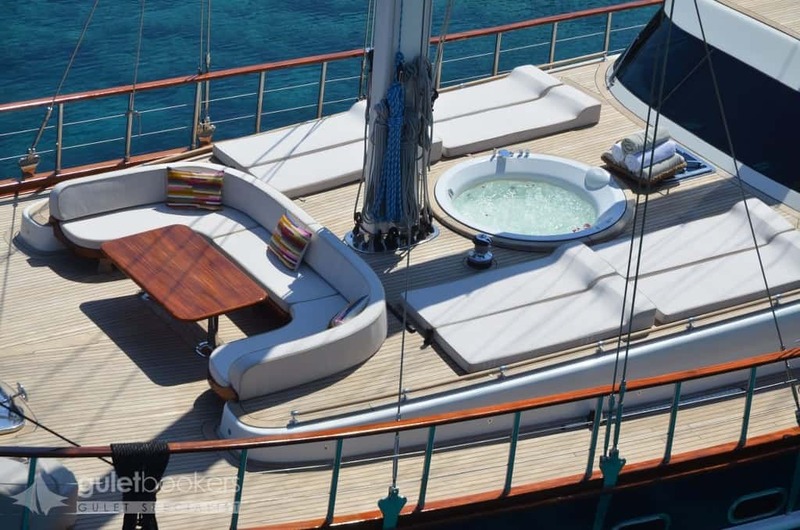 The teak deck outdoors holds the secrets to a thoroughly enjoyable and carefree holiday. 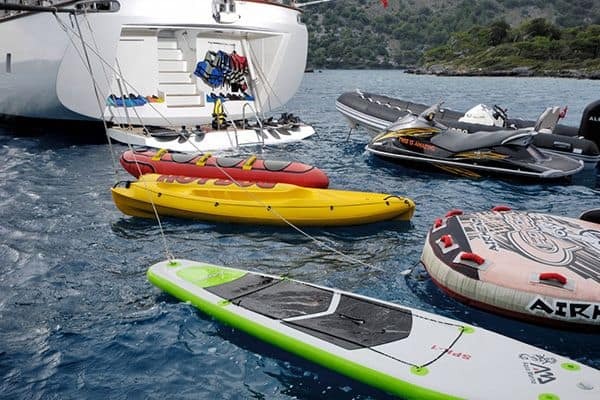 Here the cushioned lounger pads, and sunbeds beckon guests to relax in the fresh air and sunshine, with the water beside them also inviting them for a swim or play on the excellent range of water toys. 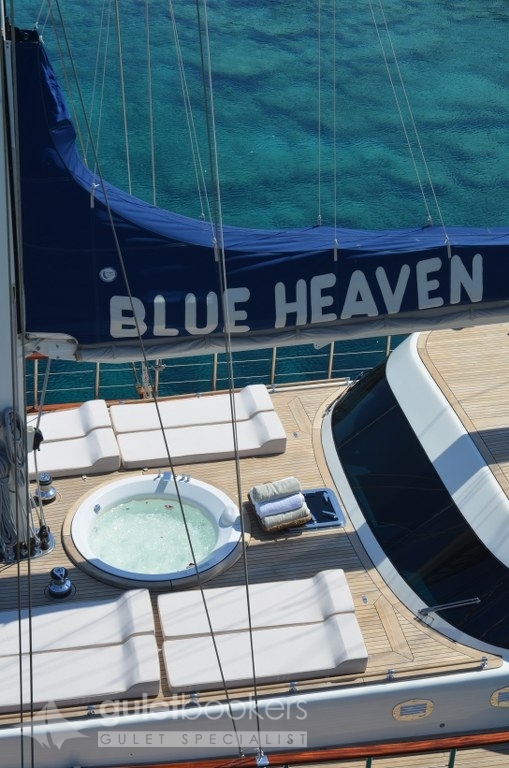 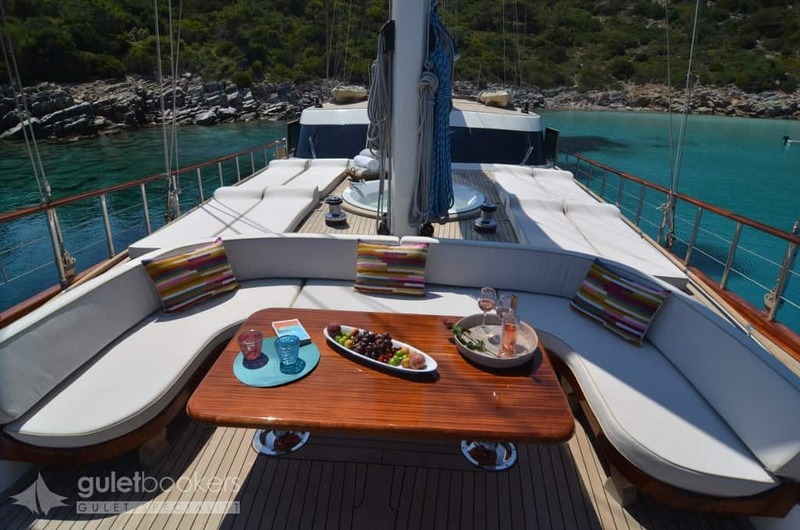 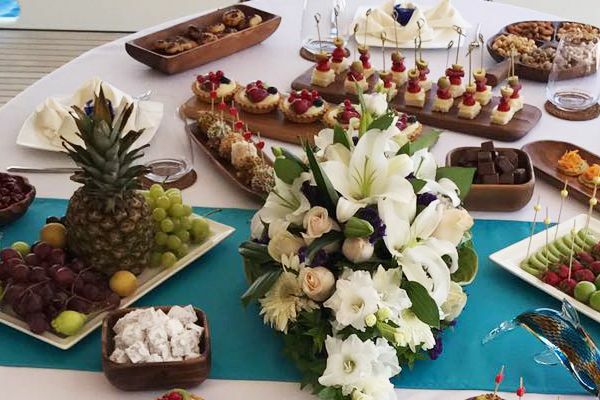 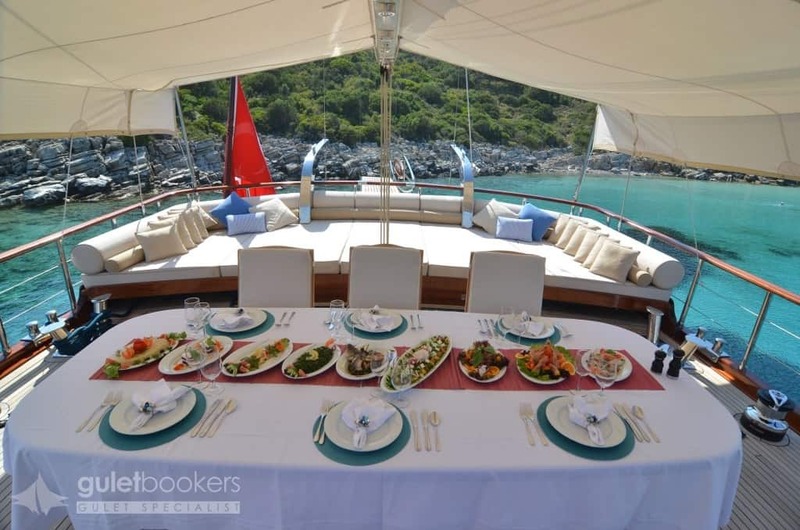 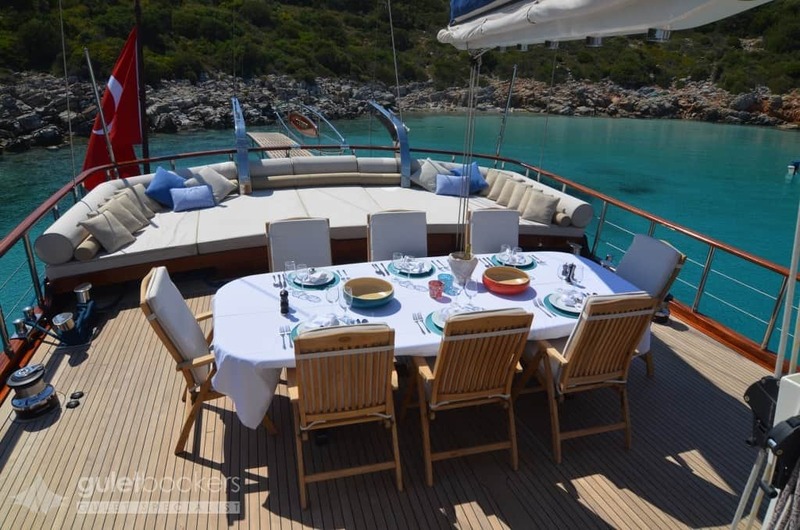 Blue Heaven’s teak outdoor table setting on the aft deck is the perfect place for some very relaxed meals, all the more wonderful for the excellent range of meals prepared and presented by the experienced and accomplished chef, steward and crew. 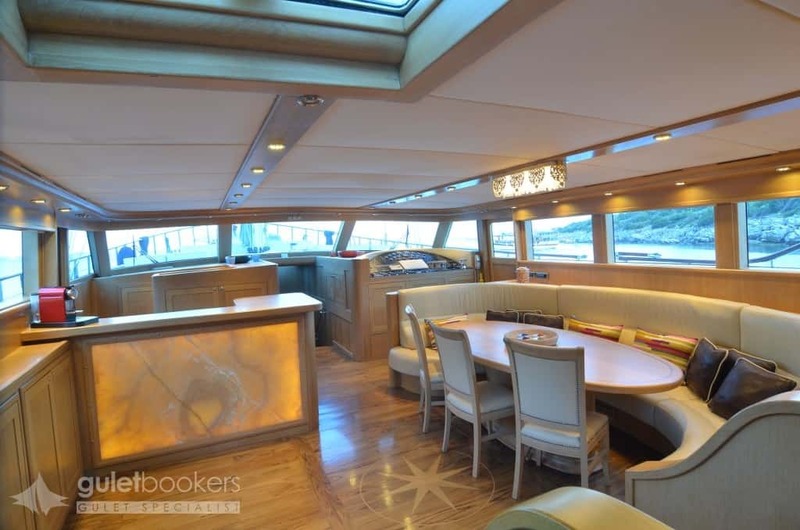 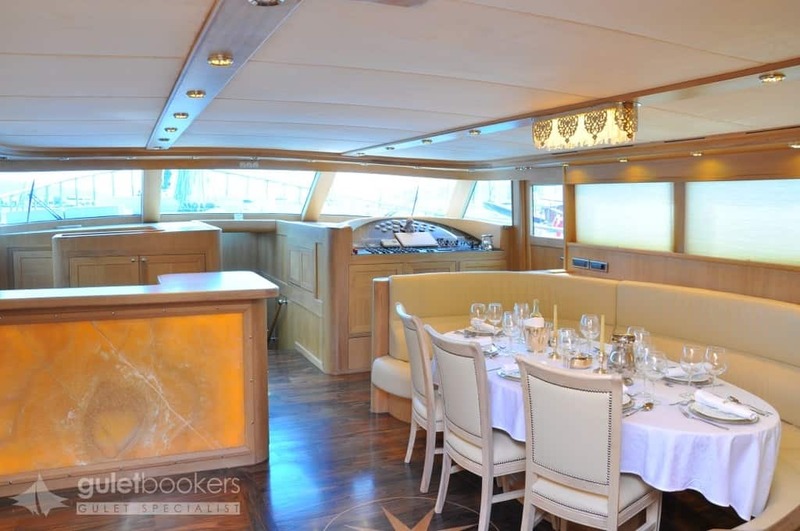 Up forward in the bow is another seat and relaxing zone complete with small tables, ideal for a drink at sunset with nibbles. 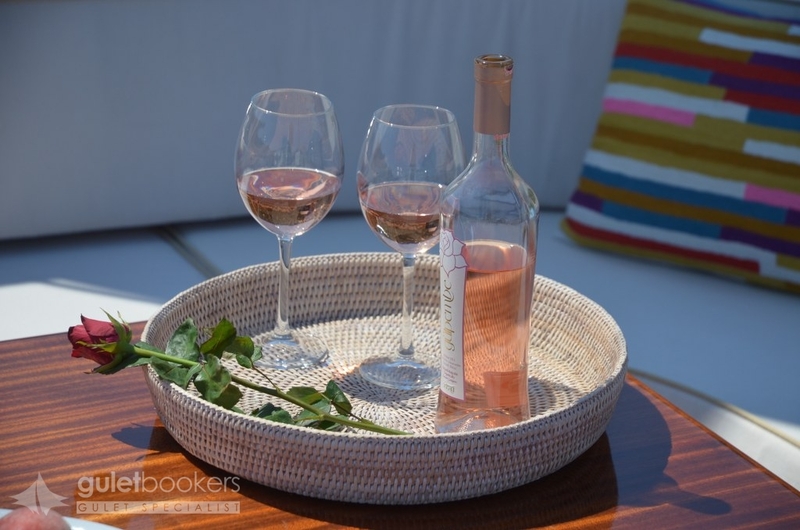 The luxury of time spent together can never be enjoyed in a better place than this, enjoying the views over the sea and coast and drinking in the fresh air. 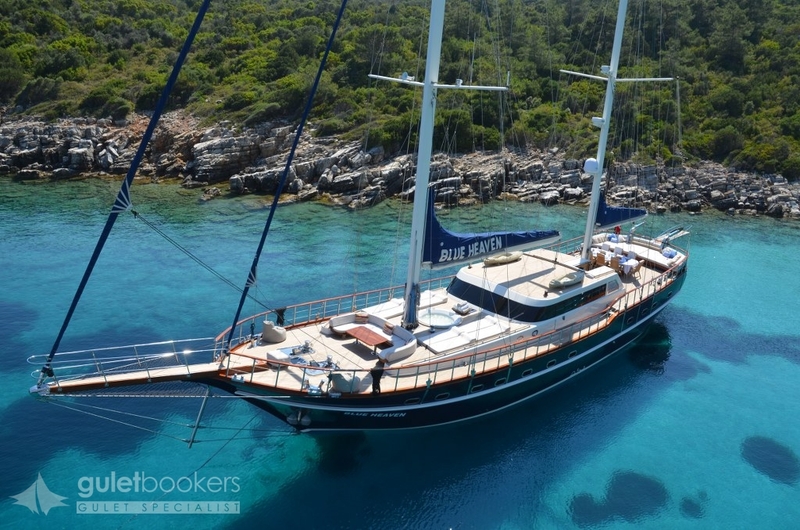 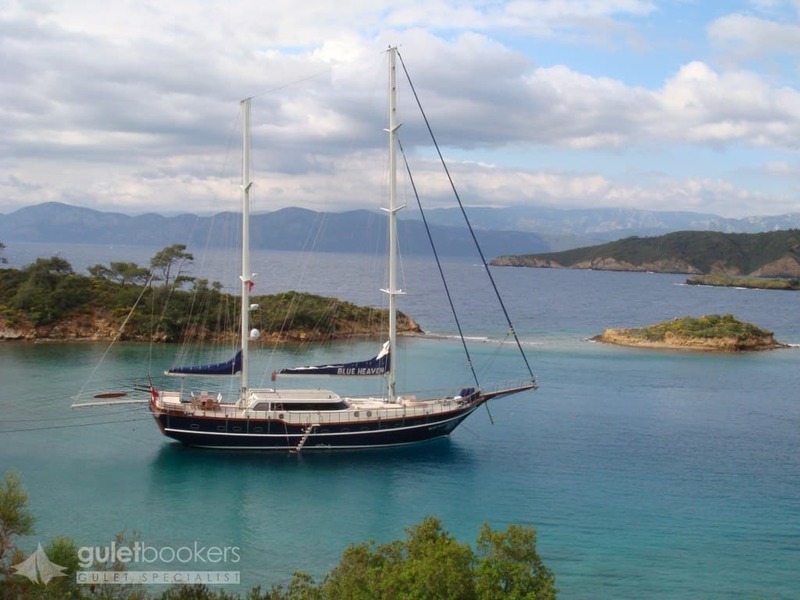 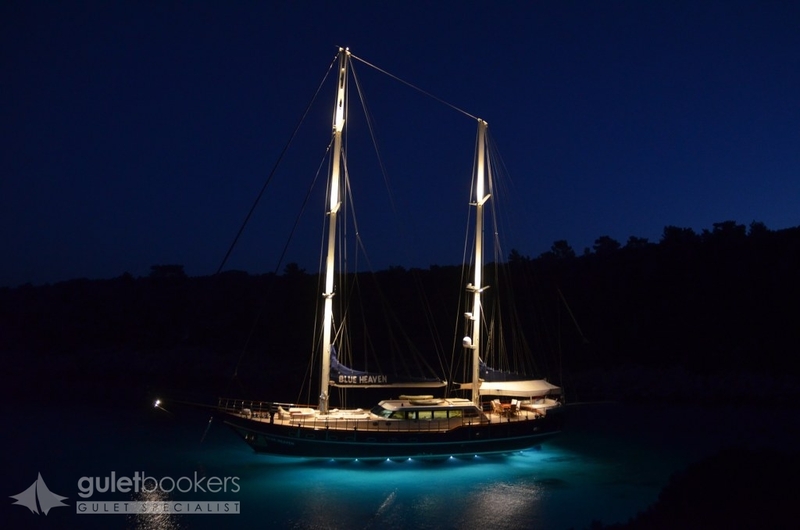 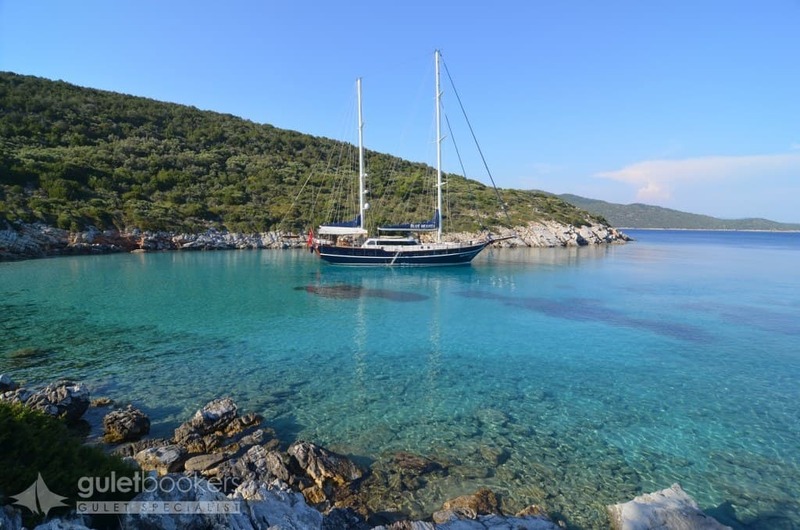 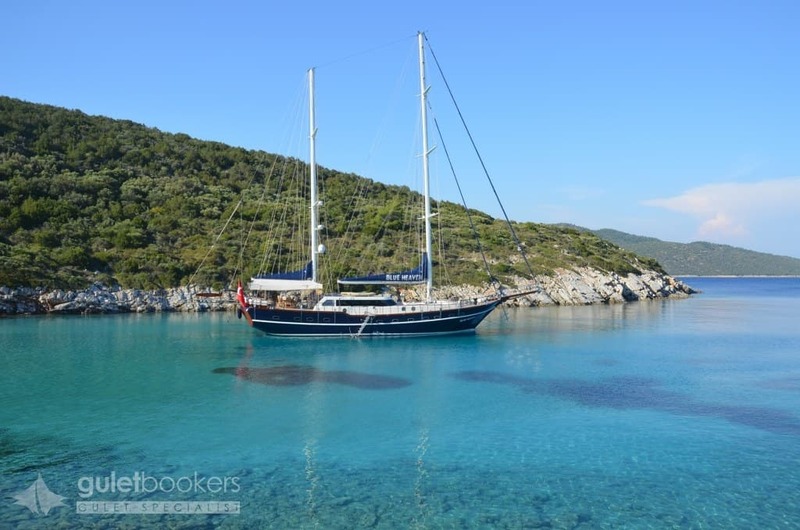 The thoroughly hospitable and professional Captain and crew anticipate and attend to all the guests needs, and manage the Blue Heaven gulet motoring and sailing if the guests wish, along the stunning coasts of Turkey and through the nearby Greek Islands of the Dodecanese.